Kinsta is a managed WordPress hosting company and I heard good reviews about them. I recently made the switch from Bluehost to Kinsta, so here’s a Kinsta review for you guys. Disclaimer: There may be affiliate links in this article. But wait, what’s a managed WordPress hosting and do you need it? If you’re just starting out as a new blogger, you may not need a managed WordPress hosting provider. A shared hosting with Bluehost or Siteground is sufficient enough for a new blog. Think of regular hosting as a guesthouse and managed hosting as a five star service. The latter definitely costs a lot more. 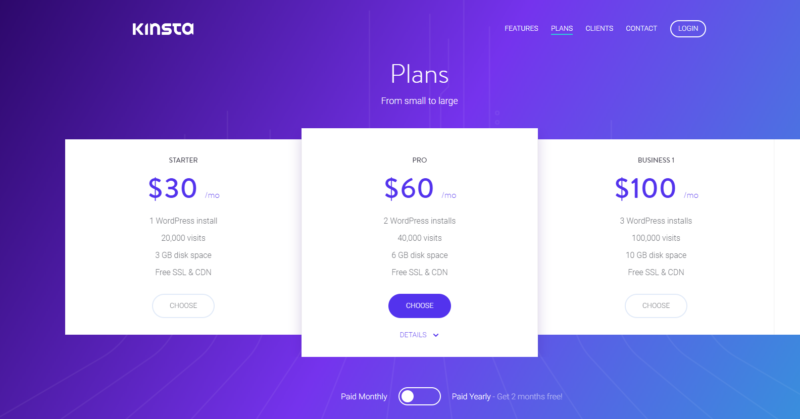 In fact, my Kinsta plan now costs about 20 times my shared hosting with Bluehost. So why would I pay more for Kinsta hosting? Well, as they’re WordPress specialists, they pretty much offer a hassle-free service. Daily backups, great support team, blazing site speed and other perks come with managed WordPress hosting. You’re essentially paying a lot more for a great experience especially if you’re bad at technical areas of WordPress. Maybe you just want to blog and not care too much about hosting and other technical issues. Then, a managed WordPress hosting is suitable for you. As my followers should know, I’ve been on Bluehost for the longest time, at least over a year. Actually, I’m still on Bluehost for my other websites, just not this particular one. So why did I switch hosts? Was Bluehost terrible for the blog? Nah, not exactly. You guys should read on my full experience with Bluehost here. Basically, this blog was on a shared hosting plan with Bluehost. I paid only about $3 a month which is super cheap. It was actually still working well for this blog most of the time. I did experience some downtimes here and there due to the SSL Certificate disappearing for a moment and other stuff. Apart from that, everything was great. It even withstood a 7 – 10k daily traffic at one point which was insane. But I knew it wouldn’t last. At some point of my blog’s life, I will have to move to a dedicated server / VPS / managed WordPress hosting. That’s simply because a shared hosting can only withstand a certain amount of traffic before you have to upgrade. Although the shared hosting was enough at the time, I wanted to find a host where I could easily scale up for traffic needs. I may be a little optimistic but I do believe this blog will continue to grow in traffic in the future. Hence, I started looking for a new host, one that could be easy to manage. So I looked for managed WordPress hosting, as they’re specialized for WordPress blogs and are quite hassle-free. After considering a few options like WPEngine, FlyWheel, WPOpt and Kinsta, I decided to go for Kinsta hosting. The price was cheaper than WPEngine but more expensive than the other hosts. However, Kinsta had great reviews, so I opted for this hosting provider. 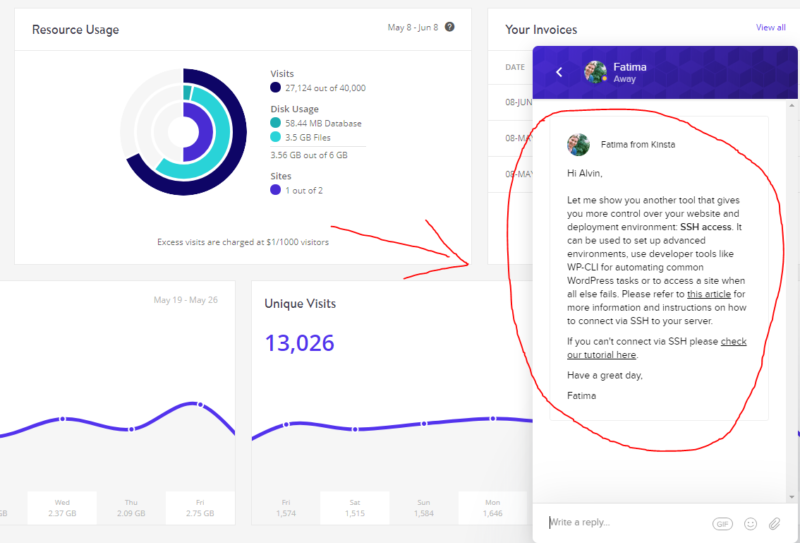 So here’s my review on Kinsta as a WordPress hosting company. I haven’t been with them long but I’ve been pretty satisfied so far. Here are some of the features I love about Kinsta hosting. I’m not good with the techie parts of blogging, especially WordPress itself as a CMS. One great thing about Kinsta is that they actually offered a free migration for 1 website. The number of free migrations given depends on the plan you choose. The plan I chose came with only 1 free migration, which is enough since it was only meant for this website. More expensive plans will have more free migrations. If you look at the image below, there’s a Migration Request Form. You just have to fill up the details and they will do it for you. Some of the details include the password for your website’s back-end and other details like SSL certificates and so on. Don’t worry though. If you don’t know how to extract some of the information required, you can just ask the staff in charge. I provided them with my Bluehost password for them to extract some of the details and conduct a smooth transition of hosts. You can read more on the free migration here. If you use up your free migration, you can still request for migrations but you have to pay them for the service. I actually loved the fact that they offered this service in the first place, which was a big reason why I chose Kinsta. One thing I didn’t like about Bluehost or other shared hosting providers was the dashboard. You’ll normally be required to access your hosting data via the cPanel which looks ancient. Needless to say, I didn’t dare to touch most of the things on the Bluehost cPanel because it looked too complicated for me. On the contrary, Kinsta’s dashboard is very user-friendly as you can see in the image above. It definitely looks like something from this century, and that’s a big plus. You can see how much data you’re using, the unique visits you’re getting and so on. If you go over the visits that your plan allows, then you’ll be charged about $1 for every 1,000 visits. I have had plenty of questions since joining Kinsta and I may have been pretty annoying. All kinds of questions were asked, i.e. on SSL certificates, nameservers and so on. However, they answered the questions every single time and normally in less than an hour. It’s like a live chat feature, so each time someone different might answer you. Like I said above, a managed WordPress hosting is like a five-star service and this is definitely five stars. If you’re used to Bluehost’s support system, then this would be like a breath of fresh air. I still recommend Bluehost if you’re a new blogger since it’s super cheap, but if you’re growing in traffic then you may want a new host like this. It’s worth paying for Kinsta’s hosting if you can afford it. What’s a staging site or staging environment for? This article may help you. To put it simply, a staging environment is to allow you to edit your website or test certain plugins without affecting your website in real-time. It creates like a separate website that is identical so that you can experiment on different themes or plugins and so on. If you’re happy with the changes, you can just click on a button to reflect the changes onto your website. As not everyone knows how to create staging sites manually, a built-in staging environment on Kinsta is quite helpful. You can just use the dashboard and change the environment to “staging environment”. Do note that most of the managed WordPress hosting providers have this feature. My website used to be slower, around the 3 second mark at best, and even worse before I moved to a premium theme. After joining Kinsta, I noticed an improvement in my blog’s loading speed, even before I did a speed test. They have their own advanced caching system and they are using Google Cloud Hosting which is really fast. Here’s the load time of my blog with Kinsta. The load time improved to 1.5 seconds. Website speed is a bigger factor these days in SEO, which prompted me to move out form shared hosting. While my site’s performance isn’t exactly good in the first place due to request size and so on, I was surprised that it could go below 3 seconds. 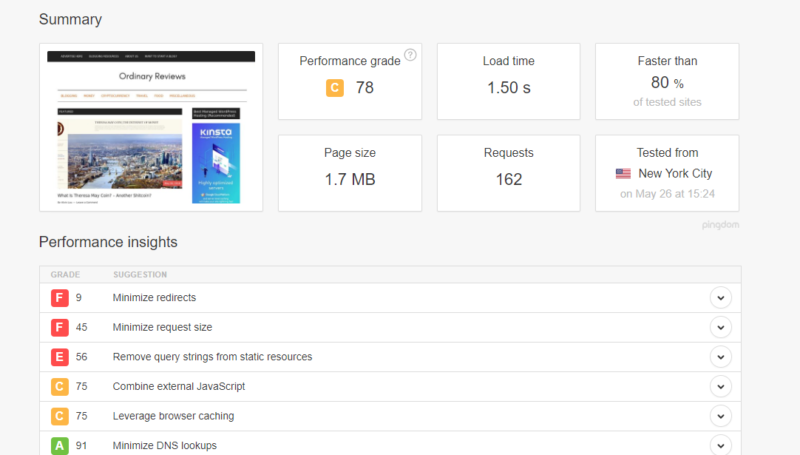 I think the most attractive perk of Kinsta is how it improved my website’s speed tremendously, over everything else. A good host is one that keeps your blog online 100% of the time. With shared hosting, you may experience downtime for hours sometimes. If you’re running a business on your site, any downtime means losing money and that’s bad for your business. Kinsta also offers daily backups, which means if you’re using a backup plugin, you no longer need it. I was using VaultPress for backups but I’ve canceled my subscription. There are of course other features of Kinsta that are not mentioned in this Kinsta review. I’m just pinpointing the features that attracted me in the first place. As Kinsta has so many perks, it doesn’t come cheap at all. For smaller blogs, you can opt for the starter plan which is $30 a month. I don’t generally recommend anyone to start a new blog with a managed hosting, unless it’s for a company’s website or you’re really bad at techie stuff. When your website is bigger in traffic, maybe opt for the Pro or Business plan as a start, and you can scale from there. At least that’s my own plan. I used to have six times the traffic for a few months on Bluehost, but it all went away. No hosting platform is perfect. Kinsta may have some disadvantages as well. Here are some for you to consider. Kinsta actually has a page of plugins that are not allowed for their platform. These are normally backup plugins, caching plugins, performance plugins and security plugins. This is the full list of banned plugins. If you’re using VaultPress like me, then you no longer need it. They have their own daily backups. They also have their own security, caching and performance plugins. As I mentioned earlier, shared hosting is really cheap and is suitable for new blogs with low traffic. I don’t think it’s worth going for managed hosting unless your blog generates enough money to pay for it every month. Price is probably the biggest disadvantage, but it’s still cheaper than WPEngine. Kinsta doesn’t provide emails, unlike Bluehost or some shared hosting companies. That doesn’t affect me much though. The thing is, it’s easy to go over your plan’s allowed visits, because visits include even bots. Google Analytics do not generally track those who use ad blockers, but Kinsta does. This means your Kinsta visits will be much higher than your sessions on Google Analytics or page views on Jetpack. Is Kinsta worth the money as a managed WordPress hosting provider? If you’re looking for incredible loading times for your blog and an almost hassle-free experience, then Kinsta is worth the money. It also depends on your budget. Is your business generating enough money to cover the hosting expenses? If money is not an issue, I definitely recommend Kinsta for hosting on your blog. They have servers around the world and when you sign up with them, you can choose the location. If you’re from South East Asia, you can choose Singapore as your server location. Wherever your server location is will affect the loading speed for internet users in the area, so choose wisely. 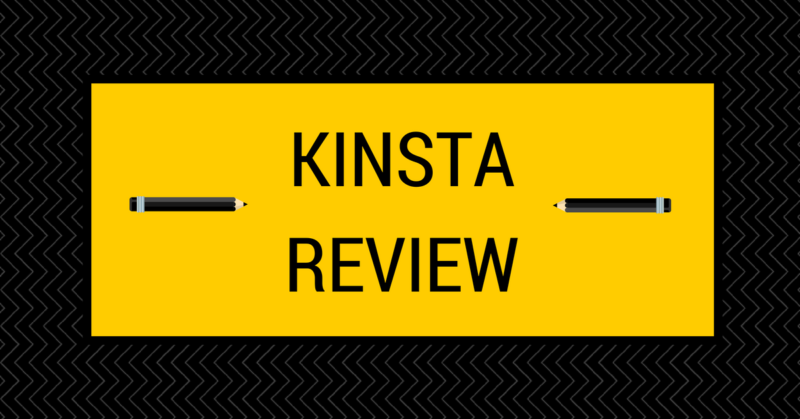 Even though I don’t make much from this blog, I still opted for Kinsta. The 100% uptime, fast loading speed, daily backups and a hassle-free experience were big factors for my transition. I do wish to build a high-traffic website with Kinsta one day, assuming their hosting service maintains or improves. Hopefully this Kinsta review was helpful for you. What differentiates Kinsta WordPress hosting from other hosting is the power it gives users to access large hosting platforms with simplicity. It is highly optimized and can handle any traffic you give it. Kinsta has a solid security and everything is backed up. Thanks for the review. It will be very helpful for me in the future if I also be able to grow the views. But for now I will continue with Bluehost shared hosting. But the post is very informative and well reviewed.